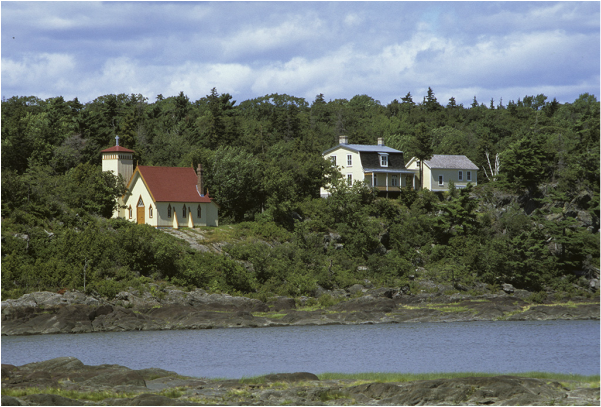 Grosse-Île and the Irish Memorial National Historic Site (NHS). With this plan, Parks Canada reiterates the importance of this site within the National Historic Sites System as well as our commitment to maintaining its integrity. In addition, the increase in visitation and the renewal of the visitor experience remain central elements in the development of our offer and our partnerships. 1) An authentic, evocative historic site focused on sustainable operations management. 2) A key heritage destination for the region. 3) An important, always accessible heritage site commemorating immigration. We thank you for your participation in this planning exercise and look forward to continuing our collaborative work that has helped more than 550,000 people discover the rich history of this site for over 20 years. Do not hesitate to contact us for any questions or comments at the usual coordinates. 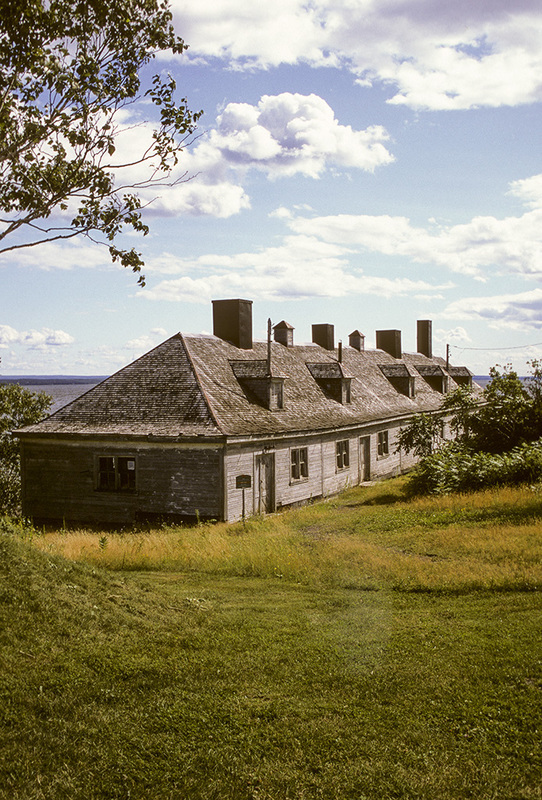 Grosse Île, Quebec was used as a quarantine station in Canada for more than a century. The tragedy that took place there in 1847 stemmed from the Great Irish Hunger, one of the pivotal events in the history of Ireland. Over 5,000 people died at sea, and 5,424 people were buried at GrosseÎle. 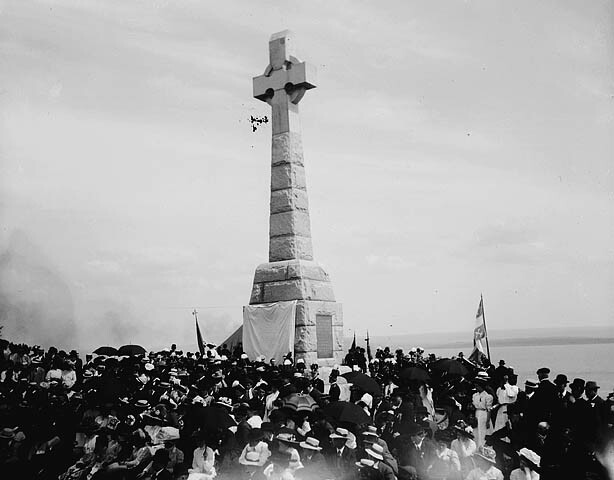 On August 15, 1909, the Ancient Order of Hibernians erected a 46 foot tall Celtic cross on Telegraph Hill, the highest point on the island, to commemorate the unlamented loss of life. The cross stands today, the eternal guardian over the hopes and dreams of those that came but did not leave. The Ancient Order of Hibernians held a weekend of commemoration, August 14-15, 2009, to mark the centenary of the cross. The rededication of the cross was held on August 15. A second day of commemoration by the Irish Protestant Benevolent Society of Montreal was held on Grosse Isle August 23, with a rededication of the Anglican chapel, recently restored by the Society. Irish Memorial National Site for Irish immigrants during the 1832 cholera and 1847 typhus epidemics. By the 1920s, Ireland had only recently emerged from the violent years of the War of Independence and the Irish Civil War, and the partitioning of the island into Northern Ireland and the Irish Free State. The country at this time was primarily an agrarian society of tenant farmers and was still underpopulated following the tremendous death and emigration of the Great Famine of 1842-1852. In 1926 its population was at a historic low of just under 3 million. Anglican Church & Station Chief Residence, Grosse Ile. View from the Harbour. Old housing at the Landing Station, Grosse Ile NHS. 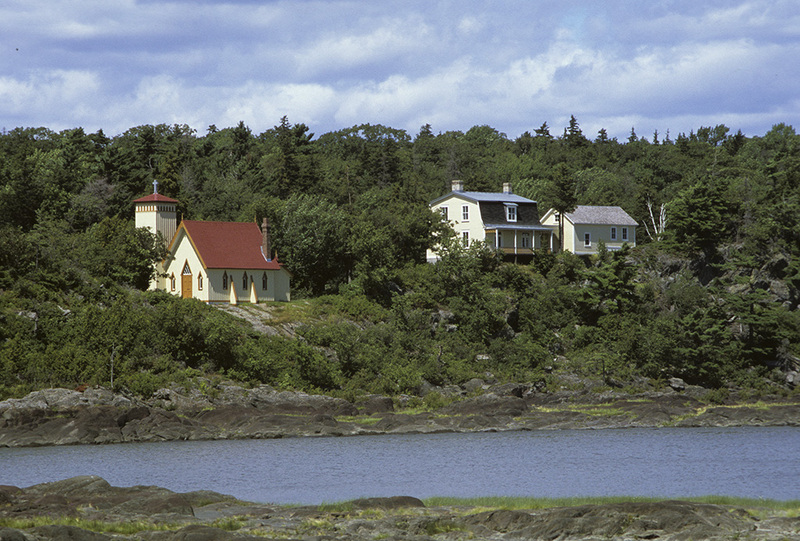 In concert with the Anglican Diocese of Quebec and with Parks Canada, the IPBS made a capital contribution of $25,000 to the restoration of the Protestant Chapel at Grosse Isle, which was the major retention area of Irish immigrants arriving in Canada under the most challenging economic conditions. In addition, the IPBS contributed - with the Anglican Diocese of Quebec - a brass plaque listing the 17 Protestant Ministers who served and ministered on Grosse Isle as a memorial to future generations to tourists to celebrate and remember. "The restoration of the Chapel has been made possible by the generous contribution of the Irish Protestant Benevolent Society of Montreal"
​Many of the IPBS members travelled to Grosse Isle on August 22, 2009 to celebrate the re-consecration of the Chapel in a memorable service of thanksgiving. The plaque in memory of the Anglican clergy who served at the Quarantine Station in 1847 was placed in the Anglican Chapel in 2011 by the Irish Protestant Benevolent Society. 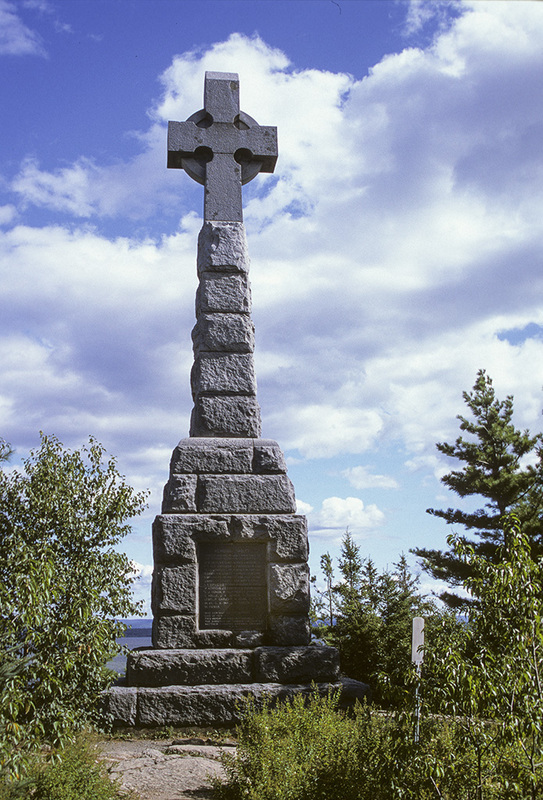 It was removed for a short period of time last summer 2014 so that the Grosse-île-and-the-Irish-Memorial NHS staff could make a new wooden rack to support it. The old one was in bad condition and a hazard for visitors' security. At the beginning of next season (2016), visitors will be able to see the plaque at its original place. 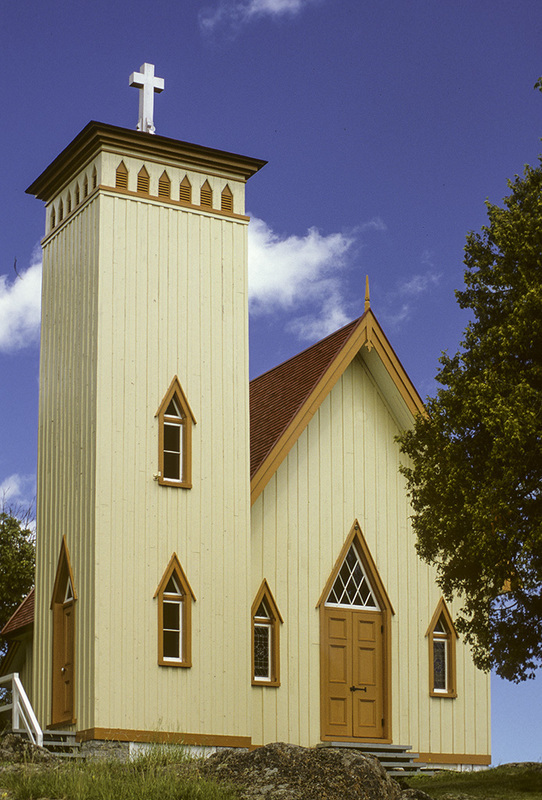 St. John the Evangelist Anglican Chapel at Grosse Ile. A memorial was unveiled in 2009 to Anglican clergy who served during the tragedy of 1847 as well as a rededication of St. John the Evangelist Anglican Chapel at Grosse Ile.